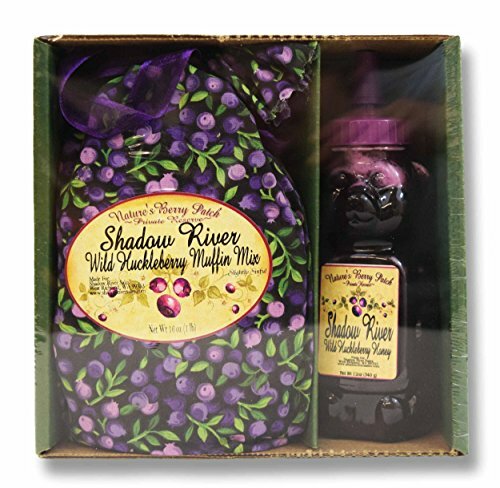 From Nature's Berry Patch Private Reserve comes a new selection of tasty Shadow River Wild Huckleberry products, meticulously prepared from time honored family recipes enhancing the intensely delectable flavor of these wild berries. A quick and natural breakfast to go has never been this simple, with our easy to bake muffin mix and honey gift set. It includes a 16oz package of Wild Huckleberry muffin mix (with directions), and a 12oz squeeze bear of Wild Huckleberry honey, packaged together in an attractive gift box (box colors may vary). We have blended honey with wild huckleberries to perfection, creating a wild huckleberry honey that will satisfy any wild huckleberry lover. Muffin mix contains wheat, soy, milk & eggs. Proudly made in the USA.